The reliable Triangle hoops writer Dan Wiederer discusses 3 big takeaways from Duke’s game in Dubai. All I hope is that Ryan Kelly wears the “special panda hat” he picked up in China when the weather turns cold in Durham. That’d be the fashion statement of the semester. Jon, who signed with Maccabi Tel Aviv in June, has arrived in the Jewish homeland. Maccabi starts play in late October. Euroleague teams only play about once a week, leaving more time for those physical, scrappy and foul-prone practices that produce insatiable ballers like Pau Gasol. Here’s hoping that Jon gets a few years of solid European experience and makes it back to the League. 2012 shooting guard commitment Rasheed Sulaimon recently participated in the Elite 24 game in Venice Beach, California. DevilHoops.com caught up with him for an interview. Sounds like Rasheed is developing a good relationship with Duke’s players and staff, and he wants to win a high school state championship. 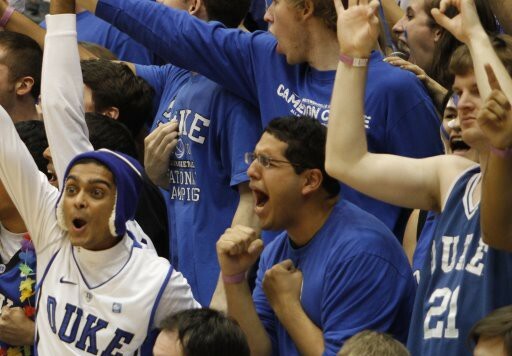 Good luck, ‘Sheed, can’t wait to see you on campus where you can reunite with some Duke TIP buddies. Corey Maggette recently signed with PAOK, a basketball team in Greece. The author of above article on Ball Don’t Lie questions the Greek fanfare for Maggette, an apparently “soul-sucking” player. But PAOK fans just seem to go wild about basketball in general. Duke’s student newspaper did an excellent job in coverage the team’s trip to China and Dubai. Check out all the coverage in this cool multimedia timeline on the Chronicle sports blog. That’s all for now, folks! Try to shed the sadness of the football debacle and look forward to next weekend when we play…oh…Stanford. Hm. See you there.